Feb. 16, 2017 - A porch swing proved to be too much for Ricky the goat, who comically collapsed in fright at his Ohio home after experiencing the sudden motion. The video was shot by the goat's owner, David Taneyhill, and shows Ricky and his sister Lucy playing in a yard. When Lucy jumps onto the swing, causing it to rock towards Ricky, the latter stiffens and keels over in fright. His temporary paralysis lasts only a few moments before he jumps back up, unfazed. Their bizarre display of fear appears humorous and only harms them if they faint from a tall surface. However, the goats are still susceptible to stress if purposefully frightened. 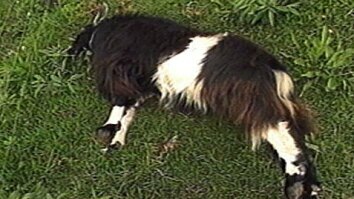 This strain of livestock are properly called Myotonic goats but they go by a number of common names, including: wooden leg goats, Tennessee fainting goats, stiff leg goats, and nervous goats. They get their name from a genetic condition called myotonia congenita, which causes their muscles to briefly stiffen after they are startled. 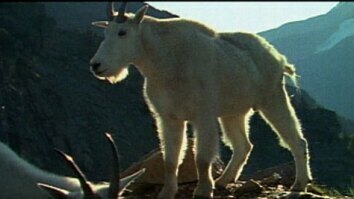 The breed is one of only a few types of goats native to North America and, as their name might indicate, they are commonly found in Tennessee and neighboring states in the South. 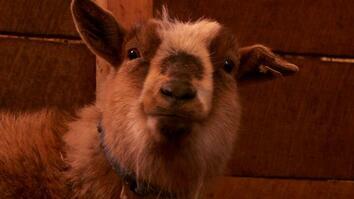 Click here to read more about Ricky the goat.